I’m excited to announce that I’ll be doing my third ever 10k run this year, as part of VitalityMove – Jessica Ennis-Hill’s Running Festival. 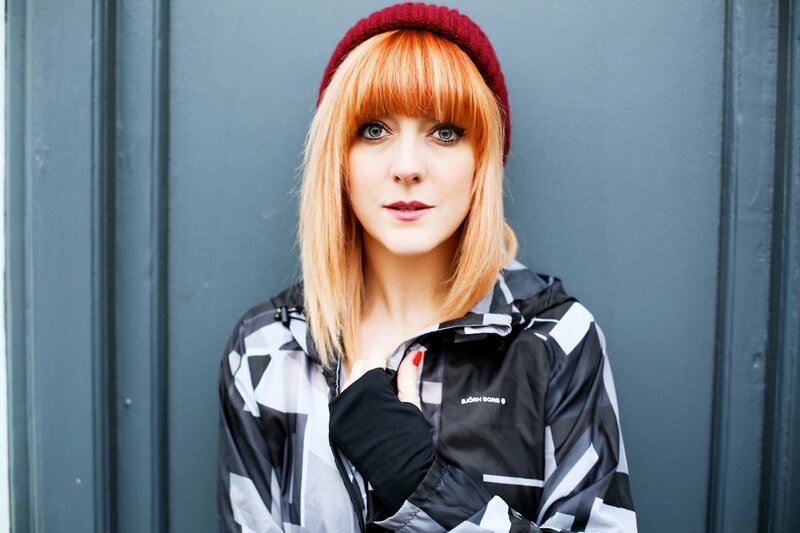 I was contacted by the Vitality UK’s VitalityMove team a couple of months back, and invited to be of their ‘Movers’ – a group of fitness and lifestyle Influencers blogging about their journey to race day. Find out more about us on the VitalityMove website. Want to take part in VitalityMove running festival? Live up north? 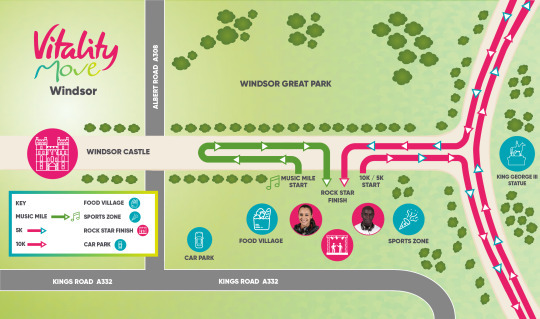 Check out Jessica Ennis-Hill’s Running Festival at Chatsworthon Sunday 9th July – for 10k, 5k and Trevor Nelson’s Music Mile. If you’d like to take part in this year’s VitalityMove Running Festival down south, at Windsor Great Park – like me, on 17 September 2017 – you can also choose the running distance to suit you. Choose from 10km and 5km distances or unlimited laps of the one mile music-themed circuit. Whether you’re up for a challenge and want to train towards a 10k – or perhaps you’re pretty new to running and are currently doing your first ‘couch to 5k’, there’s also a music mile for those of you who just want to have a bit of fun with your friends and family. I’m not an advanced runner, not by any stretch of the imagination. But, it has always been a sport that I’ve found somewhat easier than, say, Tennis… or anythinn requiring hand to eye coordination. The last two times that I did a 10k, it was with Nike as part of their #WeOwnTheNight campaign, around Victoria Park in east London. This means that to hit my PB (personal best) I need to aim to complete the VitalityMove 10k at Windsor Great Park in under 00:51:48 mins. But this time promises to be completely different. I mean, it says there are hills! Eek! Ok guys, we have 109 days of training left, that’s 16 weeks to get up to speed. I’m aiming to run 2-3 times a week, alongside my existing gym and kettlebell workouts. You can follow my VitalityMove training journey over on instagram.com/lucieloves and be sure to check out the other Movers progress using the #VitalityMove hashtag – and don’t forget to share your own training updates and tips too! The run course at Windsor Great Park is a real runner’s paradise. With stunning views of the sweeping parkland, the 10k route is one loop all within Windsor Great Park. Taking you over mostly tarmac paths with some grassy sections, the course has several flat stretches but is definitely undulating in parts to make your run challenging and interesting! But remember: what goes up must come down - the final 2km take you downhill along the Long Walk towards Windsor Castle for your very own rock star moment at the finish line. They had planned a flat route… until Jessica got married, then they decided to add a Hill! The 5k course is fairly undulating but they’ll reward you with some fun surprises on the way round. 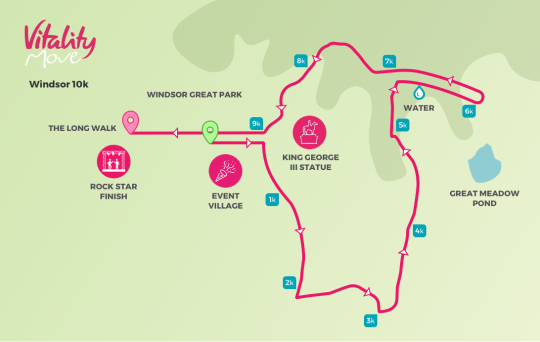 Starting on the Long Walk, the route will take you out into Windsor Great Park and back on mostly tarmac paths. 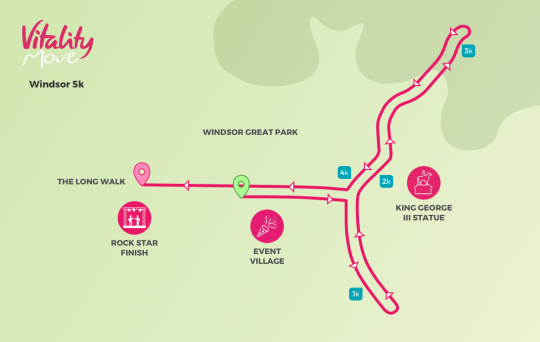 And don’t forget, what goes up must come down - the final stretch along the Long Walk takes you downhill towards Windsor Castle and you’ll get your very own rock star moment at the finish line! 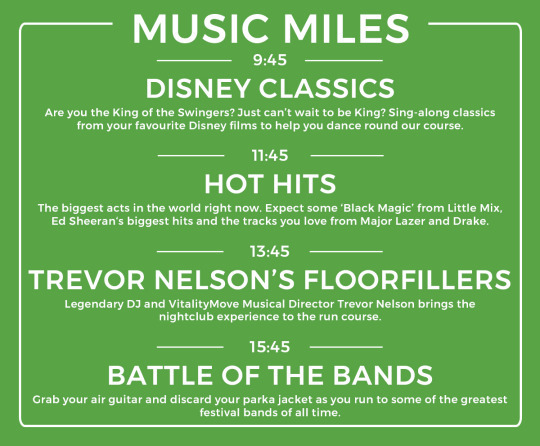 You can get an unlimited Music Mile pass giving you access to the miles all day long, or get one free with your Challenge 10k or Fun 5k entry… and don’t forget, kids go free! 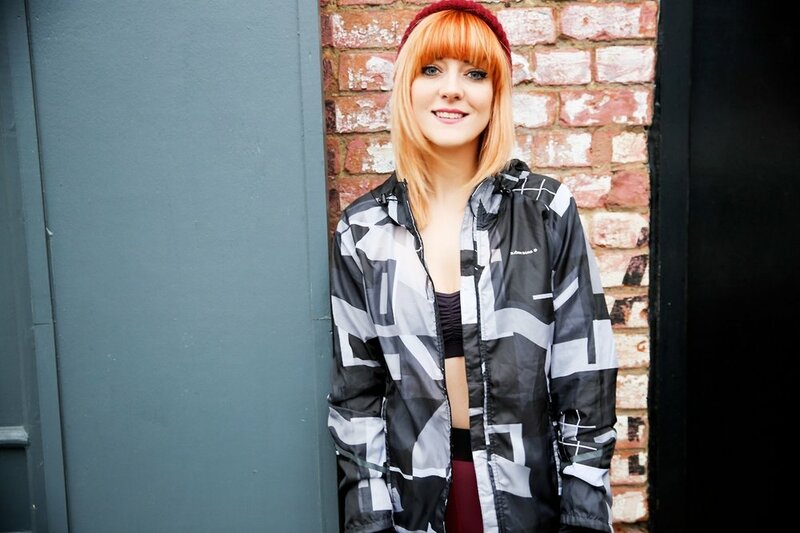 Need a few running tracks to get your moving? Check out the VitalityMove playlist on Spotify. Are you already running the VitalityMove festival at Chatsworth or Windsor? Get in touch! ** Lucie wears Bjorn Borg + Koral Activewear available from Strip Wax Bar, whilst stocks last ** see more photos from The Strip Series.